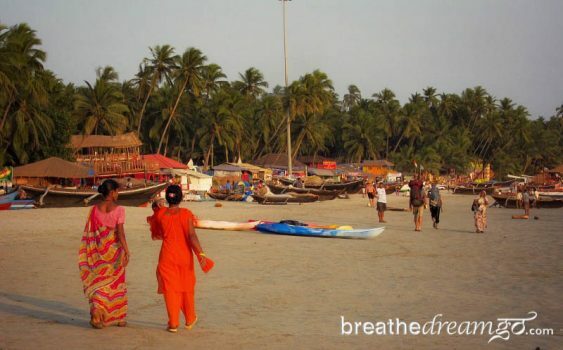 I avoided Goa for a long time, travelling the length and breadth of India on several trips, but never making it to the vacation hot-spot known for beaches, sunsets and parties. But when I decided it was time to see what all the fuss was about, I was still intent on doing it my way. This is what happened. 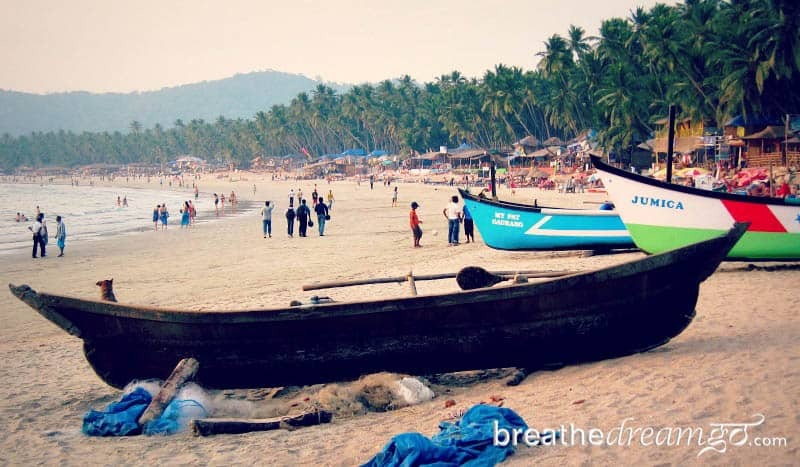 Famous for full moon beach raves, a hippie-run night market and the kind of laid-back tropical vibe you can really only find in Asia, Goa is one of India’s most touristy areas. 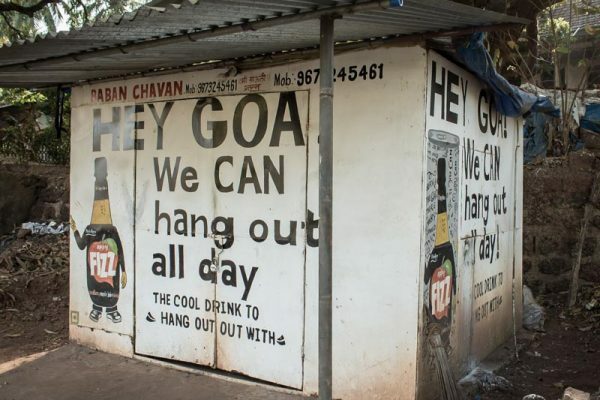 The combination of Portuguese colonialism in the past and a high influx of foreigners in the present, make Goa seem like the least Indian part of India, to me. Which is pretty much why I had avoided it on my first three lengthy trips to India. But on my fourth trip to the subcontinent, I decided it was time to experience Goa, if only for-once-and-for-all. 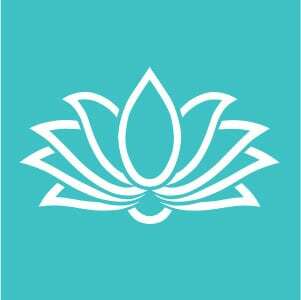 I carefully chose the Bhakti Kutir, an eco-resort that seems to grow organically out of a banana grove. 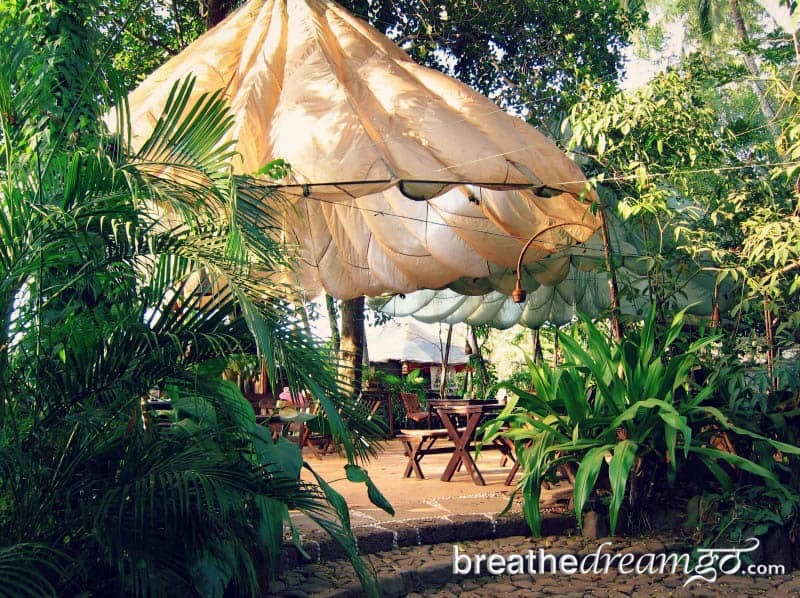 Sanskrit for “a home for devotional meditation,” the Bhakti Kutir is ideally situated on a small hill between two beaches in south Goa. Because it isn’t on the beach, it’s quiet, and because of the lush vegetation, it’s semi-hidden. Clouds of mosquitoes at dusk are the only damper on this small piece of tropical eco-paradise. On arrival, I fell immediately in love with my “nature cabana,” and especially the outdoor bathroom, which I wrote about in Beach side in Goa. 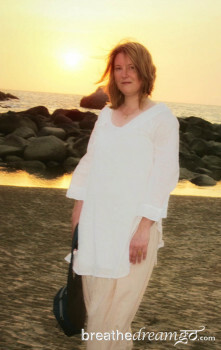 After exploring the charmingly eccentric grounds of the Bhakti Kutir, I lit out for the beach. Or, I should say, beaches. 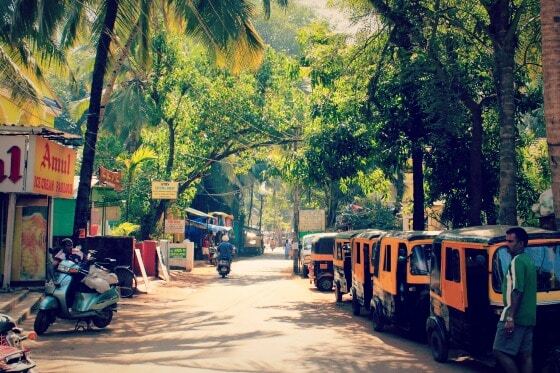 Palolem Beach was a short walk down a gentle slope to the north; and Patnem Beach was a 10-minute walk down a back country road and through a tiny fishing village to the south. They were both close by, they were both fabulous Goan beaches with names beginning with “p,” but there the similarities ended. Patnem and Palolem beaches were only minutes away from each other — but world’s away in terms of atmosphere and facilities. 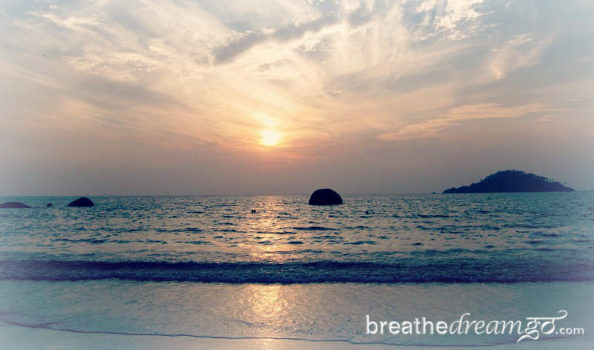 According to my trusty guidebook, Palolem was described as a recently discovered gem, “one of Goa’s most beautiful spots with a friendly, laid-back vibe.” And it is a stunning crescent-shaped beach with rocky outcroppings at each end, perfect for watching the sun sink into the Arabian Sea, and a wide expanse of sand with plenty of room. But it’s also lined with small beach hut resorts, outdoor restaurants, souvenir shops and all the other paraphernalia of a tourist trap for beach bums. Most of the people on the beach were deeply tanned foreigners, swimming, playing volleyball, walking along at the edge of the surf or relaxing with beers in the outdoor restaurants. There was a distinct party vibe in the air. I could easily imagine this beach as a setting for moonlit raves. After walking the length of the three kilometre beach and back it was late and I had to wait for the following day to check out Patnem Beach. Right after breakfast I made my way along the sunny back road, stopping to chat with some local girls selling beach fashions. One girl said, about my fair complexion, that I looked like a milk bottle. Then, to cool down, I bought a tender coconut from an elderly toothless man, who never stopped smiling at me. Passing through the small village, I stopped at a booth selling spices and handicrafts and talked to some local women about how to use the spices to make teas and sauces. Then I got to the beach. Delight dawned. For almost as far as I could see, a billowy white sand beach spread out before me, lapped by the gentle waves of a calm, protected bay. There was about one person for each of my fingers on the beach, plus a few stray dogs. Mostly, it was sea, sand and birds flying, darting and playing in the surf. The sea was bathwater warm and the very few, very modest establishments serving drinks and snacks were astonishingly relaxed. You were welcome to lay down your towel and beach bag on a lounge chair; no one would harass you to buy; no one was on this beach to make money. Here was a place I could just be; a place where my thoughts could float and bob along with the incoming waves. I lolled in the tepid waters, drank coconut water under an umbrella and meditated beside a big rock at the remote far end of the beach. There are things in life that are like a litmus test; they tell you who you are. Palolem and Patnem beaches are like that. You can only be on one at a time, you have to walk north or south, you have to choose. And every day after breakfast for seven days, I picked up my bag and towel and walked south. Click here for a perfect beach packing list.